question_answer1) How have the Prashastis drawn the factual information about the Gupta rulers? question_answer2) The Lingayats disapproved certain practices of the Dharmashashtras. Cite any two such practices. question_answer3) Name the region where the Lottery Committee initiated town planning during the 18 century. Mention any one feature of it. question_answer4) Why were the water resources of the Vijayanagara Empire developed? Give reasons. question_answer5) Examine the policies adopted by the British towards the Paharias during early 18 century in Bengal. question_answer6) Explain the strategies for procuring materials by the Harappans for the craft production. question_answer7) Historians have used avariety of sources to reconstruct the history of the Mauryan Empire. State any four such sources. question_answer8) Identify the distinctive features of the imperial household of the Mughal Empire. question_answer9) Critically examine Lord Dalhousie's policy of annexation in Awadh. 'Love is stronger than hate.' How true is this value which was proved at the time of the partition of India' What are the values one needs to instill and nurture to avoid hatred' Explain. 'The Revolt of 1857 marked first nationalist challenge to the English in India.? Explain giving examples the values imbibed and practised by the rebels to set the beginning for it. question_answer11) 'The Salt March of 1930 was the first event that brought Mahatma Gandhi to world attention.' Explain the significance of this movement for Swaraj. question_answer12) 'The architecture in colonial Bombay represented ideas of imperial power, nationalism and religious glory.' Support the statement with examples. question_answer13) Describe the life of forest dwellers in the Mughal era. question_answer14) How did Sutta - Pitaka reconstruct the philosophy of Buddhism? Mention about Buddhist Tipitaka. Here is a story from the Adi Parvan of the Mahabharata Once Drona, a Brahmans who taught archery to the Kuru princes, was approached by Ekalavya, a forest-dwelling nishada (a hunting community). When Drona, who knew the dharma, refused to have him as his pupil, Ekalavya returned to the forest, prepared an image of Drona out of clay, and treating it as his teacher, began to practise on his own. In due course, he acquired great skill in archery. One day, the Kuru princes went hunting and their dog, wandering in the woods, came upon Ekalavya. When the dog smelt the dark nishada wrapped in black deer skin, his body caked with dirt, it began to bark. Annoyed, Ekalavya shot seven arrows into its mouth. When the dog returned to the Pandavas, they were amazed at this superb display of archerty. They tracked down Ekalavya, who introduced himself as a pupil of Drona. Drona had once told his favourite students Arjuna, that he would be unrivalled amongst his pupils. Arjuna now reminded Drona about this. Drona approached Ekalavya, who immediately acknowledge and honoured him as his teacher. When Drona demanded his right thumb as his fee, Ekalavya unhesitatingly cut it off and offered it. But thereafter, when he shot with his remaining fingers, he was no longer as fast as he had been before. Thus, Drona kept his word: no one was better than Arjuna. (i) Why did Drona refuse to nave Ekalavya as his pupil? (ii) How did Ekalavya react to the demand of his Guru? (iii) Mention two versions of Guru - Shishya Parampara mentioned in the given extract. (i) Why did Bernier consider this treatment as a crucial marker of the difference between western and eastern societies? (ii) What role did the Indian patriarchal society play towards this social evil? (iii) Compare the condition of the women of the era mentioned above to that of today. It is no use saying that we ask for separate electorates, because it is good for us. We have heard it long enough. We have heard it for years, and as a result of this agitation we are now a separate nation ... Can you show me one free country where there are separate electorates? If so, I shall be prepared to accept it. But in this unfortunate country if this separate electorate is going to be persisted in, even after the division of the country, woe betide the country; it is not worth living m. Therefore, I say, it is not for my good alone it is for your own good that I say it, forget the past. One day? we may be united ... The British element is gone, but they have left the mischief behind. We do not want to perpetuate that mischief (Hear. hear). When the British introduced this element they had not expected that they will have to go so soon. They wanted it for their easy administration. That is all right. But they have left the legacy behind. Are we to get out of it or not? (i) Why are separate electorates considered as a mischief? (ii) State the arguments given by Sardar Vallabh Bhai Patel for building political unity and forging a nation. (iii) How did the philosophy of separate electorates result in a separate nation? 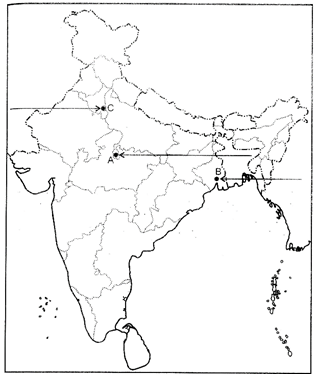 (ii) On the same outline map of India, three centres related to the Revolt of 1857 have been marked as A, B and C. Identify them and write their correct names on the lines drawn near them.